The show was crowded but strangely no one was in the first room with the etchings. 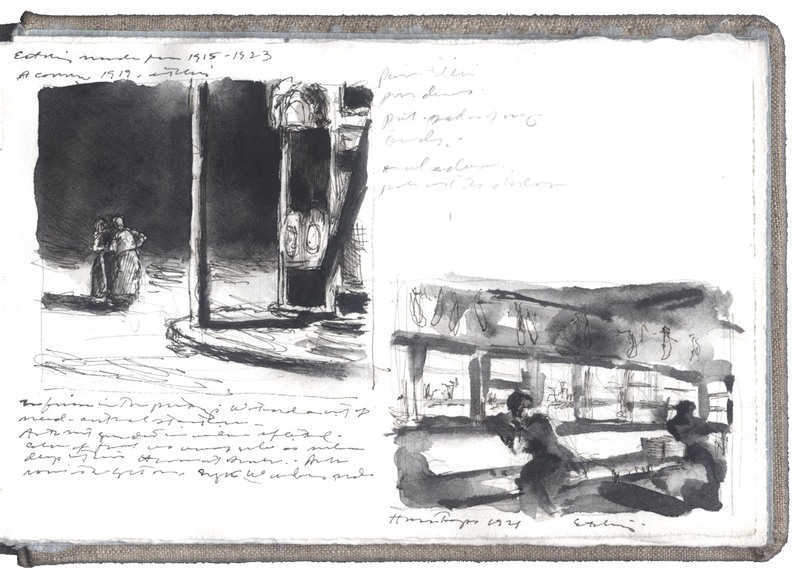 I fell in love with the tiniest work in the show, A Corner, 1919 [upper left on journal page]. Telephone pole bisecting the composition, lots of pairs: two figures, swinging doors, telephone pole and its broken shadow. Very minimal with no minutiae. Just dark trenches of etched line excavating white paper. The white of the paper and thinking ahead to where to preserve it in the composition is so important. That’s one of the great intersections of making prints and painting watercolors. The planning. The light is already there. It’s left to the artist to make the best of it. Otherwise, the white of the paper is hard to beat just by itself.